This revelation, if true, is a clear violation of section 139(2) of the Criminal Code. Your Globe and Mail link only works if you are a subscriber. Let’s see Jody cross the floor. One good back stabbing deserves another. TreeGuy wrote: Your Globe and Mail link only works if you are a subscriber. I'm sure that this will balloon today into other media, saw it first mentioned on BNN/Bloomberg. My respect for Jody Wilson-Raybould is growing faster than the federal deficit today. C.T.V. and others picking it up now. OTTAWA -- The Globe and Mail says former justice minister Jody Wilson-Raybould disappointed the Prime Minister's Office by refusing to help SNC-Lavalin avoid a criminal prosecution. Want to see a man lying? Watch this video on Global as Trudeau sticks to a script, and refuses to answer the questions asked of him. He's busted. Rot in jail, Justin. But he refused to give clear answers when pressed by reporters on whether he or his office tried to “influence” the prosecution of the case more broadly. “The allegations in the Globe story this morning are false,” Trudeau told reporters when asked about the allegations. Reporters noted that the questions raised in the article are not only about “directing” action. “Not necessarily direct, prime minister. Was there any sort of influence whatsoever,” one reporter asked. Interesting story. This one is a real hot potato for the Liberals. It has the potential to hang over them like the Duffy scandal hung over the Conservatives. Good for the free press for getting this out there. Certainly has boxed SNC in. The corrupt %$^&% only have one out now, the success or failure of their judicial review application regarding the prosecution proceeding. My bet is the courts decide that a full prosecution is the way to go. There is something about the Quebec construction business culture that is rotten. It extends into other areas, like shipbuilding in ways that I don't understand, but there is something that so often seems to have a bad smell about it. The other thing that has a bad smell about it is the influence in Ottawa of the PMO unelected players. Good for Jody! She "blew them off". It is a shame that Michael Chong's attempts to fix that PMO influence got gutted during the Harper government. Brent Rathgeber is the kind of politician we need more of, and the "boys in short pants" did him in. It looks to me like "the boys in short pants" may have done in Jody. It looks to me like Jody put what is right ahead of the nonsense from the boys in short pants, and paid a price. "Brent Rathgeber, the MP for Edmonton-St. Albert, describes the gulf between the way the system is supposed to work and the way it is working in his new book, Irresponsible Government, The Decline of Parliamentary Democracy in Canada. Rathgeber left the Conservative caucus to sit as an independent last year to escape the boys in short pants. “Observers and former ministers confirm that PMO decisions and plans are distributed at cabinet meetings for perfunctory approval or rubber stamping,” he writes." This story looks on the surface like a continuation of that same problem. Too many times we see ministers and MPs that are doing a good job getting benched for no apparent reason, and I suspect it is "the boys in short pants" behind it. There is far too much power given to the PMO. If this story has real "legs" it could be the end of JT and the Liberals chances this fall, but if that is the case, will we be just trading one set of "boys in short pants" for another? My guess is yes, especially with Hamish Marshall at the top of the heap in Conservative politics. It is high time for real democratic reform. That can only come by freeing up MPs to follow the lead of those like Brent Rathgeber, Michael Chong, and Jody Wilson-Raybould who want to what is right. That responsibility lands with us, the voters, to vote in the best candidate in each riding, regardless of party affiliation. It is a real shame that a dedicated person like Brent Rathgeber got pushed right out the door by "the boys in short pants". What a piece of *bleep* our current PM is. Can't wait for Scheer to clean up this *bleep* pile the Liberals have built in Ottawa. I don’t know how anyone can seriously say something like Trudeau=Trump. 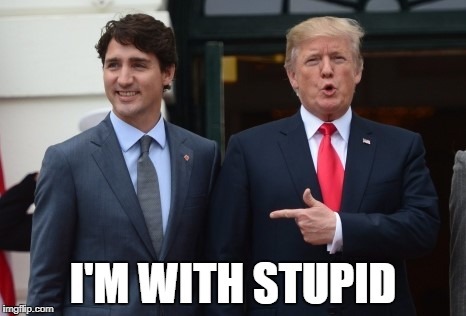 Omnitheo wrote: I don’t know how anyone can seriously say something like Trudeau=Trump. Trump actually cares about his country. But this scandal doesn't involve Trump. It involves Trudeau, and he's in the same boat as Gérald Tremblay. Actually, probably in a worse boat, as Trudeau is now caught trying to corrupt the judicial system at the highest level. Tremblay was just in a municipal hole. Wow, JW-R really foretold her story about Trudeau's interference in the SNC case on the day he fired her from the Attorney General position. Just look at the highlighted sections of what she wrote that day. She knew this story of the prime minister's office's corruption would eventually come out. This story reminds us why it's not easy to predict election outcomes months in advance. This story could be Trudeau's undoing. Looking at what we have seen, and Trudeau's non-answers today, along with the previous comments from Jody Wilson-Raybould, it would certainly appear that Trudeau and the PMO were engaging in improper conduct. Many were scratching their heads when she was shuffled out of the AG Ministry and perhaps we now know why. Yep. NO politician should ever poke their noses into legal proceedings. If a firm like SNC wants to talk to anyone political - the answer should be "sorry, that is a legal matter, and as such we are unable to meet with you". In the end, the correct decision was made, and the courts will decide. Unfortunately, we won't get clarity until that judicial review is done. This will be an interesting mess to follow. SNC has a lousy reputation to start with. I suspect they are afraid of what a full trial will uncover, but that is just speculation. Gone_Fishin wrote: Wow, JW-R really foretold her story about Trudeau's interference in the SNC case on the day he fired her from the Attorney General position. Just look at the highlighted sections of what she wrote that day. She knew this story of the prime minister's office's corruption would eventually come out. Looked like someone photoshopped it. Let's see ur source for it . I get all suspicious when someone post something like that without one. If your writing about her defensive exit letter, she was trying to save face. The legal professionals knew she was weak and ineffective so JT did the right thing in changing her portfolio. The CCLA is already calling for a full investigation. There's a good point in the article, highlighting that the Trudeau government's illegal interference revolves around a company that is in, of all provinces, Quebec, that province that is so significant to Trudeau's hopes of re-election. The motive for his meddling has never been stronger, as western alienation rises to heights never seen before, with Quebec being his only hope. I just knew there would be some sort of sandal to refresh voters' minds before the election, but I never expected a bombshell like this one. Mr Teflon won't be able to shirk the overwhelming stink from this.